Ripe olives also called black olives are olives preserved in salt. It is found used in salads, pizza, pasta, and sandwiches. They are said to contain less fat content than unripe green olives making them lower in calories. Recipes sites show you how to use it in stir fries. 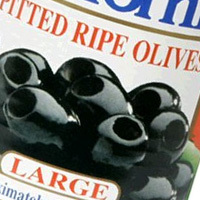 The calories in Ripe Olives per 4g(1item) is 5 calories. Ripe Olives is calculated to be 118Cal per 100 grams making 80Cal equivalent to 67.8g with 0.49g of mostly fat、0.14g of carbohydrates、0.03g of protein in 4g while being rich in vitamins and minerals such as Vitamin E Alpha Tocopherol and Copper.